Hill ran for 30 yards on eight attempts, adding a nine-yard reception during Sunday's 34-32 win against the Buccaneers. 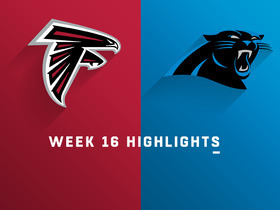 Hill carried eight times for 115 yards and lost a fumble during Sunday's 24-10 win over the Panthers. Analysis: Hill was thrust into a prominent role after Tevin Coleman (groin) left the game, as the team had no other tailback available. He gashed the Panthers several times as he topped the 100-yard mark, including an electric 60-yard gain. Considering that the team has nothing left to play for, Coleman could be held out of action next Sunday against the Buccaneers, which would give Hill the opportunity to build on this surprising performance. 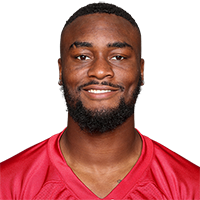 Hill is the only other active tailback behind Tevin Coleman for Sunday's Week 16 tilt against the Panthers with Jeremy Langford declared inactive for the contest. Analysis: The second-year back will thus have any leftover carries all to himself. Hill rushed three times for seven yards Week 15 against the Cardinals and has carried just four times overall on the season. Given the Falcons' propensity for leaning heavily on the pass, Hill's workload is expected to be fairly limited despite his No. 2 role Sunday, although coach Dan Quinn did confirm earlier in the week he was planning to give Hill a closer look over the final two games. Coach Dan Quinn plans to get a closer look at Hill after Ito Smith (knee) was placed on injured reserve, Vaughn McClure of ESPN.com reports. Hill picked up five yards on one carry during Sunday's 34-20 loss to the Packers. Hill will be available for Sunday's game against the Panthers, D. Orlando Ledbetter of the Atlanta Journal-Constitution reports. Analysis: Hill was promoted from the practice squad Tuesday with Devonta Freeman dealing with a knee injury. Freeman has now been ruled out for Week 2, opening the window for Hill. Tevin Coleman and Ito Smith should see the bulk of the reps at running back, while Hill will likely be limited to special teams, barring an injury. The Falcons signed Hill to their active roster Tuesday, Will McFadden of the team's official site reports. Analysis: Starting running back Devonta Freeman is nursing a knee injury but is expected to play Sunday against the Panthers. Still, the second-year pro will add depth to the position just in case. Hill averaged 5.1 yards per carry this preseason, and a majority of his snaps will come on special teams in Week 2. Hill signed on to become the 11th member of the Falcons practice squad Monday, Kelsey Conway of the team's official site reports. The Bengals are waiving Hill, Paul Dehner Jr. of The Cincinnati Enquirer reports. Analysis: Hill lost a tight battle with Tra Carson for one of the final roster spots. Selected in the fifth round by Atlanta last year, Hill figures to land on the Cincinnati practice squad if he isn't scooped up by another team. Hill ran well again in the Bengals' preseason finale against the Colts on Thursday, but so did his roster spot competition Tra Carson, Geoff Hobson of Bengals.com reports. Analysis: Rookie Mark Walton hurt his shoulder in the game, but it's uncertain how significant the injury is. But there's probably only one spot between Hill and Carson. Hill could be in jeopardy of losing his job, Paul Dehner Jr. of Cincinnati.com reports. Analysis: The Bengals opted to spend their fourth-round pick on running back Mark Walton from Miami. While Walton figures to pencil in behind the likes of Joe Mixon and Giovani Bernard, there's a strong chance he'll slide above Hill on the depth chart. If that's the case, expect Hill's value to drop immensely, especially if he's unable to escape the current landscape of Cincinnati's clouded backfield. Hill was on the field for 28 snaps in the Bengals' Week 17 win over the Ravens, but did not have a carry nor a target in the passing game. Analysis: The fifth-round rookie out of Wyoming finishes the season with 11 carries for 37 yards, along with two catches for 36 yards. He'll most likely remain the Bengals' third-string running back next season behind Joe Mixon and Gio Bernard, with Jeremy Hill likely departing via free agency. Hill could be relegated to third-string duties Sunday against the Ravens with Joe Mixon (ankle) expected to play, Katherine Terrell of ESPN.com reports. 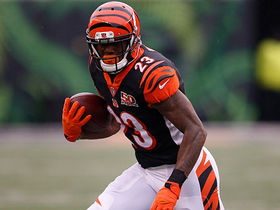 Hill is expected to serve as the primary backup to Giovani Bernard in Sunday's game against the Ravens with the team not expecting Joe Mixon (ankle) to play, Ian Rapoport of NFL Network reports. Hill (ankle) logged a full practice Thursday, Jay Morrison of Cox Media Group reports. Analysis: Hill's full session sets him up to play Sunday against the Lions. The rookie running back logged five carries against the Vikings on Sunday, but his role will likely dissipate with Joe Mixon (concussion) looking like he will play in Week 16. Hill is dealing with an ankle injury and was a limited practice participant Wednesday, Paul Dehner Jr. of The Cincinnati Enquirer reports. Analysis: Hill may have sustained the injury in Sunday's loss to the Vikings, in which he totaled five carries for 12 yards. The 22-year-old served as Gio Bernard's backup the last two weeks, but with Joe Mixon (concussion) a full practice participant Wednesday, Hill is likely to return to the role of No. 3 running back. Hill had five carries for 12 yards in Sunday's loss to the Vikings. Analysis: Hill once again was the backup to Gio Bernard, with Joe Mixon inactive. Those five carries that Hill received were the only five offensive snaps he received. He'll likely be relegated back to special teams duty once again this week, presuming that Mixon returns. Hill had two carries for eight yards and a two-yard reception on his only target in Sunday's loss to the Bears. Analysis: The carries were the first of the Wyoming rookie's career. In fact, he received his first seven offensive snaps of his career in the game. With both Joe Mixon and Giovani Bernard banged up in practice Wednesday, Hill might garner a closer look by the Bengals this week. Hill signed with the Bengals on Tuesday. Analysis: Hill spent one game with the Falcons active roster earlier this season before being demoted to the practice squad. He'll now head to Cincinnati after Jeremy Hill (ankle) was placed on injured reserve this past weekend. Hill, Brian that is, should play a reserve role on the Bengals offense behind Joe Mixon and Giovani Bernard, at least until he gets a better understanding of his new team's playbook. 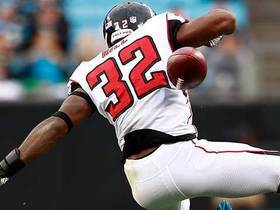 Atlanta Falcons running back Brian Hill zips past the Carolina Panthers defense for a 60-yard gain. 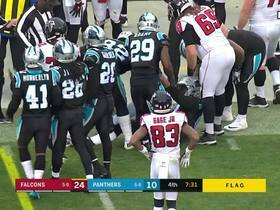 Carolina Panthers defensive end Julius Peppers recovers the loose ball from Atlanta Falcons running back Brian Hill after he tries to leap over a Carolina Panther defender. Cincinnati Bengals running back Brian Hill takes the drop off pass from QB Andy Dalton and works his way through the Lions defense for a big gain.